A common theme I hear from patients is that their injury “happened at the gym,” and very often they were either just beginning their fitness journey or increasing the intensity of their current routine. The urgency and excitement that comes with starting new goals brings intense focus and often overzealous ambitions that can quickly lead to injuries that ultimately set you back from your goals. Your back is involved in most weight training exercises, so if you experience low back injury, it can affect most exercises you do at the gym, preventing you from training. There is a tendency to skip over warm ups to get right to business, however, your body really does need to be prepared for your workout, especially if you have been sitting all day. A warm up prepares your mind and body for what is ahead by increasing elasticity of muscles and ultimately reducing your risk of injury. An example of a good warm up is a 5 min. walk with an incline on the treadmill followed by 5 minutes of overall gentle stretching. Then EASE into your workout. Walking straight over to the squat rack and firing out 10 reps with a loaded up bar after sitting all day will eventually catch up with you, just don't do it. Never swing your back while lifting weights, for example, while doing bicep curls; this is poor technique. Only move the body part you are working and in a controlled manner. Your low back is most vulnerable in a flexed forward position while twisting to the side. This is a common position I see lifters do while moving dumbbells or plates from the rack to the bench to the floor etc. Always lift with your knees, never with your back. Remember, slow and controlled, keeping your spine neutral. If an exercise hurts, stop! If the pain doesn't resolve right away, rest for a day or until the pain resolves, but do not push through pain. Adopting the “No pain, no gain” philosophy is another avenue towards injury. It is not good to overexert yourself past your limit or lift excessively heavy weights. This causes stress and strain on muscles and tendons leading to pulls and tears. Lifting too heavy will also compromise form, which puts strain on your back. 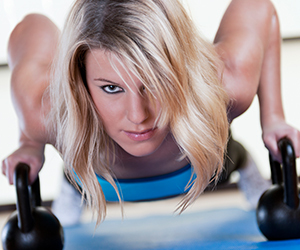 Gradually working your way up to harder/heavier workouts will build true strength and endurance. While weight training, it is critical that you be in tune with your body at all times. Pain induced by injury is different than pain produced by exertion. Your core is a natural stabilizer of complex movements and a strong one will help prevent back injuries. Strengthening your core also helps with balance, stability, coordination and posture. Doing the same workout day after day, is not only boring, it can lead to overuse injuries. Vary your workouts by modifying exercises, cross training, working only certain muscle groups on certain days or revamping your entire workout routine. For example: Cycle on day 1, weight train on day 2, run on day 3, weight train on day 4 etc. A cool down makes all the difference, even if it is just for a few minutes. STRETCH and foam roll muscles that have been worked out as they may tighten up, increasing your risk of injury. Cooling down also helps regulate blood flow and bring your body back into balance. I hope these simple reminders will help prevent gym related injuries. Everybody is different and what one person may need will differ from what another person needs. Bottom line, listen to your body and your body will thank you.